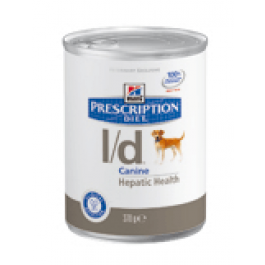 Hill's Prescription Diet l/d Canine provides complete balanced nutrition for growing puppies as well as adult dogs. It is recommended for liver disorders, hepatic encephalopathy, portosystemic shunt and copper storage disease. Highly digestible protein, carbohydrate and fats - reduces workload on the liver. Increased zinc and vitamin K - helps reduce the risk of deficiencies common in liver disorders. Reduced copper - helps reduce copper accumulation in the liver. Added L-carnitine - helps improve fat metabolism to limit hepatic lipidosis. Added soluble fibres - helps decrease ammonia reabsorption in the bowel. Reduced sodium - helps limit portal hypertension and ascites. Increase potassium - helps avoid&nbsp;hypokalaemia. Added superior antioxidant formula - neutralises free radicals. Ground rice, animal fat, soybean meal, vegetable oil, dried whole egg, maize starch, maize gluten meal, digest, cellulose, fish oil, dicalcium phosphate, potassium chloride, dried beet pulp, calcium carbonate, L-lysine hydrochloride, L-arginine, iodised salt, taurine, L-carnitine supplement, L-tryptophan, vitamins and trace elements. 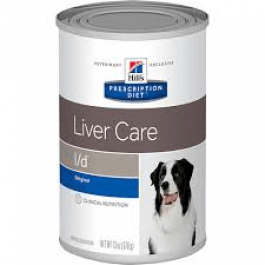 Hill's Prescription Diet l/d Canine should be recommended by your veterinary surgeon. For detailed information on feeding amounts and how this food can help your pet, please consult your veterinary surgeon. Exclusively feed the recommended Prescription Diet food and keep fresh water availalbe at all times. Please note that this is a guide only and that individual animals may have different requirements. Adjust the feeding amount to maintain the optimal body weight. A 370g can is equal to 120 grams of the dry food.